Today, we’ll look at some new numbers on just how big the problem is, then I’ll recap the various angles we’ve discussed. This problem is so big that we easily overlook key points. I hope that listing them all in one place will help you grasp their enormity. Next week, and possibly a few after that, I’ll describe some possible strategies to protect your assets and family. Now on with the end of the train. Talking about global debt requires that we consider almost incomprehensibly large numbers. Our minds can’t process their enormity. How much is a trillion dollars, really? But understanding this peril forces us to try. 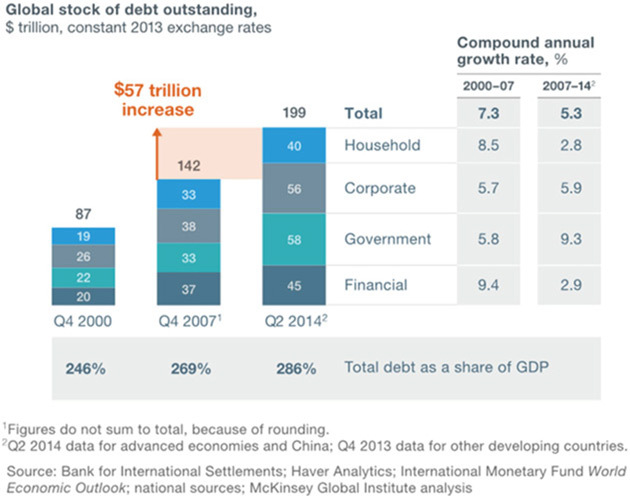 Earlier in this series, I shared a 2015 McKinsey chart that summed up global debt totals. They pegged it at $199 trillion as of Q2 2014. Note that the debt grew faster than global GDP. Everything I see suggests it will go higher at an ever-increasing rate. 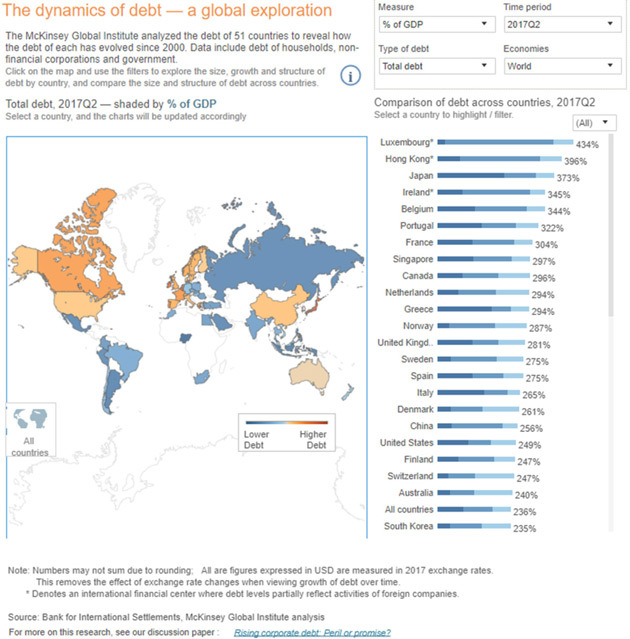 Last month, McKinsey published a very useful online tool for visualizing global debt, based on Q2 2017 data. It shows a total of $169T, which is less than McKinsey said in 2014. Is debt shrinking? No. The new tool excludes the Financial debt category, which was $45T three years earlier. A separate Institute for International Finance report said financial debt was $59T at the end of 2017. These aren’t quite comparable numbers, but in the (very big) ballpark range we can estimate total debt was somewhere between $225T (per McKinsey) and $238T (per IIF) in mid-2017. (IIF’s latest update last week says it is now $247T). That would mean world debt grew something like 13% in the three years ended 2017. If so, it would be a slowdown comparable to the 2007-2014 pace McKinsey showed in the chart above—but still faster than world GDP grew in those three years. McKinsey says global debt (ex-financial) grew from $97T in 2007 to $169T in mid-2017. Importantly, households aren’t driving this. Governments accounted for 43% of the increase McKinsey cites and nonfinancial corporate debt was 41%. That is where I think the coming train crash will originate. Governments have more debt than corporations, but also more tools (like taxing authority) to manage it. On the other hand, governments also have massive “unfunded liabilities” that don’t show in the numbers above. So, they aren’t in a great position, either. Bottom line: There’s going to be a train wreck here. Which train will go off which track is unclear, but something will. And we’re all going to feel it. His point is subtle yet critical. Post-crisis growth, mild as it’s been, has been largely a function of debt, which central banks encouraged and enabled. The result was inflated asset prices without the kind of “recovery” seen in previous business cycles. Interest rates, i.e. the cost of debt, thus became critical. With rates now moving up again, premium asset prices are losing their raison d’etre and will stabilize and eventually fall. Peter Boockvar says this, not the conventional business cycle, is what will set off recession. That’s key. Lower asset prices won’t be the result of the next recession; they will cause that recession. I showed in that letter how companies will need to refinance about $4T of bonds in the next year, almost all of it at higher rates. This will hit debt-burdened companies that are already struggling and make it almost impossible for some to keep operating. Lenders, i.e. high-yield bond holders, will try to exit their positions all at once only to find a severe shortage of willing buyers. The following week in Train Crash Preview, I listed the steps in which I think the crisis will unfold. They fall in four stages. The Beginning of Woes: Something, possibly high-yield bonds, will set off a liquidity scramble. It will spread through the already-unstable financial system and trigger a broader credit crisis. Lending Drought: Rising defaults will force banks to reduce lending, depriving previously stable businesses of working capital. This will reduce earnings and economic growth. The lower growth will turn into negative growth and we will enter recession. Political Backlash: Concurrent with the above, employers will be automating jobs as they grow desperate to cut costs. Suffering workers—who are also voters—will force higher “safety net” spending and government debt will skyrocket. A populist backlash could lead to tax increases that prolong the recession. The Great Reset: As this recession unfolds, the Fed and other central banks will abandon plans to reverse QE programs. I seriously think the Federal Reserve’s balance sheet assets could approach $20 trillion later in the next decade. But it won’t work because the world simply has too much debt. They will need to find some way to rationalize or “reset” the debt. Exactly how is hard to predict but it probably won’t be good for lenders, or for the holders of government promises like pensions and healthcare. Next in High Yield Train Wreck, we dove deeper into the dream-driven high-yield bond market exemplified by this year’s nutty $702-million WeWork issue. I quoted Grant Williams, who wrote a masterful takedown of this craziness. Ten years into the ongoing laboratory experiment being conducted by the world’s central banks, everywhere you look there are multiple examples of the kind of lunacy those policies have fomented by reducing the cost of capital to virtually zero and forcing investors to take risks they would ordinarily avoid in order to find some kind of return. WeWork is one example of a company for whom, in the face of rapid growth, massive negative cashflows aren’t a problem, but there are plenty of others. Uber, AirBnB, SnapChat and, of course, Tesla have all captured the imagination of investors thanks to lofty dreams, articulated by charismatic CEOs—but the day things turn around and the economy begins to weaken or, God forbid, investors seek a return on their investment as opposed to settling for rolling promises of gigantic, game-changing revenues to come, it is over. We went on to talk about the insanity of yield-hungry investors practically throwing cash at borrowers while demanding little in return. 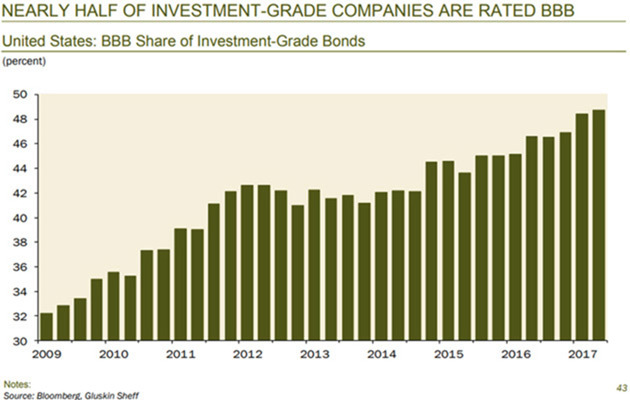 I also showed how this is not simply a junk-rated company problem, since almost half of investment-grade companies are rated BBB and could easily slip to junk status in a downturn. The week after we turned to Europe in The Italian Trigger. Unfortunately, Italy isn’t Europe’s only problem. The big Kahuna is Germany, which spent years offering generous vendor financing to the rest of the continent to entice the purchase of German goods. The result: a giant trade surplus for Germany and giant, unpayable debts for those who bought German goods. The Euro currency union is fatally flawed because it leaves each member state to set its own fiscal policy. There are good reasons for that, but it is not sustainable indefinitely. The Eurozone must get either much more centralized or fall apart. All the Rube Goldberg contraptions the ECB and others invent are temporary fixes. They’ve worked so far. They won’t work forever. I still think the most probable scenario is that Germany and the Netherlands (and the rest of the northern European cabal) reluctantly agree to let the European Central Bank mutualize all the sovereign debt, taking onto their balance sheet and issuing new ECB-backed debt for the entire zone. There would have to be serious constraints on running deficits after that point, but it would prevent a breakup, or at least delay it for another decade or so. Of course, within a few years those new deficit constraints would be ignored. I said in a previous letter Germany will need to collect almost 80% of GDP in 30 years in order to be able to deliver its promised healthcare and pensions. Their inability to do that will be evident much sooner. Germany will end up becoming one of the biggest problems. The next installment, Debt Clock Ticking, was a bit philosophical. I talked about debt letting you bring the future into the present, buying things you couldn’t afford if you had to pay for them now. But the entire world went into debt for the equivalent of tropical vacations and, having now enjoyed them, realizes it must pay the bill. The resources to do so do not yet exist. So, in the time-honored tradition of lenders everywhere, we extend and pretend. But with our ability to pretend almost gone, we’re heading to the Great Reset. Then I reviewed some of the McKinsey and IIF numbers and described the amount of leverage that’s built up in the system. Just a decade after the Great Recession, the average non-financial business went from 3.4x leverage to 4.1x. They are now roughly 20% more leveraged than they were the last time all hell broke loose. CEOs and boards seem to have learned little from the experience—or maybe learned too much. If you believe the Fed has your back, then leveraging to the moon makes sense. The last three letters in the series got personal for many readers as I talked about pension debt. 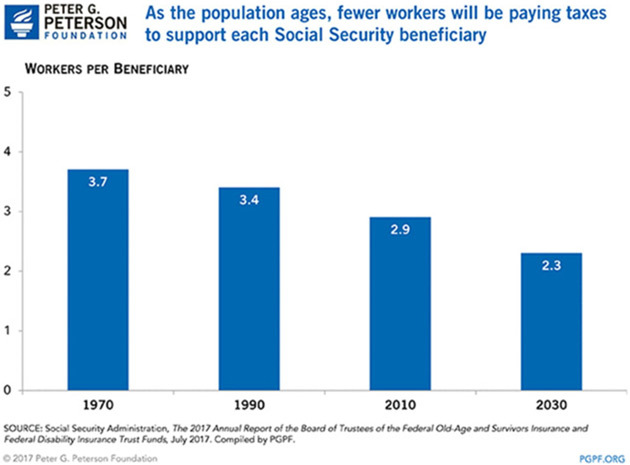 In The Pension Train Has No Seat Belts, we looked at the demographic challenge facing US pension funds, mainly state and local government plans but also some private ones. We are asking a shrinking group of working-age people to support a growing number of retirees and that’s just not going to work. The promises employers made to workers are a kind of debt. They’re the borrowers, workers are the lenders… and unlike in 2008, this time it will be lenders who get hurt the most. A new report by the American Legislative Exchange Council (ALEC) shows the unfunded liabilities of state and local pension plans jumped $433 billion in the last year to more than $6 trillion. That is nearly $50,000 for every household in America. Nor is this only a US problem, as we saw in Europe Has Train Wrecks, Too. According to the World Economic Forum, the United Kingdom alone has a $4-trillion retirement savings shortfall that will rise to $33 trillion by 2050. This in a country whose entire GDP is only about $2.6 trillion and doesn’t account for the increasingly likely disaster Brexit will be. Switzerland, Spain, and others have similarly dire outlooks, often driven by even worse demographics than we have in the US. Germany, as noted above, is simply off the rails. Finally, in Unfunded Promises, we reached the ultimate debt problem: US government unfunded liabilities. On paper, Washington’s debt is about $21.2 trillion… but that doesn’t include the $13.2-trillion unfunded, off-the-books Social Security liability, or the $37-trillion Medicare unfunded liability. Those aren’t my numbers, by the way; they come from the Social Security and Medicare trustees and are probably understated. My friend, Boston University professor Larry Kotlikoff, thinks it should be more like $210 trillion. He has a considerable amount of published works and a book he co-authored with fellow Texan Scott Burns. That’s not all. The federal government also has liabilities for civil service and military pensions, veteran benefits, some defaulted private pensions via PBGC, and open-ended guarantees to entities like FDIC, Fannie Mae, and more. The budget outlook is horrible even without all that, too. The Congressional Budget Office thinks federal debt will be 200% of GDP by 2048, and that by 2041 it will take all federal tax revenue just to support Social Security, the various health care programs and pay interest. That’s before defense or anything else the government does. And that’s assuming relatively high growth and NO recessions and a rising stock market forever as we ride off into the sunset. I wrapped up quoting my friend Dr. Woody Brock, who thinks the most likely outcome will be wealth taxes at federal, state, and local levels. I truly hope he’s wrong about that, but I fear he is not. My preferred new tax for the US would be a VAT that eliminates the Social Security tax (thus giving lower-income workers and businesses a raise) but still funds Social Security and healthcare. Other government expenditures would be funded from income taxes which could be reduced significantly, and even eliminated on incomes below $50,000. Now that’s a tax cut that would boost the economy and balance the budget. There really are only two ways to solve this problem: massive taxes on someone, or a debt liquidation of some kind. And remember, if you are getting a retirement pension fund and/or healthcare, your benefits are part of that “debt liquidation.” Both will be painful. We have pulled forward our spending and must eventually pay for it. The time is coming. Please don’t shoot the messenger. Let’s summarize. Global debt is over $225 trillion. By the beginning of the next decade it could be over $300 trillion. Global government unfunded liabilities are easily in the $100-trillion range today and could easily double by the end of the next decade. Debt service, pensions, and healthcare will take 20-25% of GDP in many countries (more in some of Europe). Your mileage may and will vary by country. In some, there will be inflation and in others, deflation. We will be thinking the unthinkable and choosing policies that seem insane to even mention today. But then, think about what Japan is doing. And the ECB. Add in automation and the loss of hundreds of millions of jobs in the OECD countries. Then think about what will happen in the emerging economies. But at the same time, imagine all the new companies being built and fortunes made. The opportunities. The situation, as Doug Casey once quipped, “Is hopeless, but not serious.” Not yet. Not for you and me. Next week we’ll discuss what you can do, but not just in Thoughts from the Frontline. I mentioned recently we were working on a new project. I announced part of it on Monday, but if you missed my email, you can watch my message by following this link. Quite simply, it is the biggest free event we have ever put together for you, and we developed every single part of it with your most pressing investing concerns in mind. Watch out for an email from me on Monday, when I launch Week 1 of Bull or Bust: Navigating the High-Speed Train Wreck. I promise you won’t want to miss it. I have several visitors coming over the next nine days, then I fly to meet a special new acquaintance in Los Angeles for a day. I’ll come back, write my letter, and then Shane and I go to visit some friends in Puerto Rico. Then, of course, the annual Maine economic/fishing conference and a few weeks later, a board meeting for Ashford, Inc. at the Beaver Creek Park Hyatt which the company owns. If you are in Puerto Rico or Beaver Creek, drop me a line and maybe we can get together. It is time to hit the send button. Thanks for all the stories about YOUR immigrant families that came my way this week in response to last week’s letter. And here’s hoping we can make a little progress on the art of the trade deal. Might make us all a little less nervous, at least in the markets and many businesses. Have a great week!